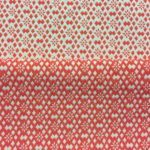 Double Faced Red and White Jacquard with a geometric pattern, a dense Cotton/Polyester blend with lycra. Heavy weight, drape, dense hand, 2-Way stretch that adds a unique versatility to this fabric. Both sides are exact opposites of each other, 60 inches wide. The double sided fabric could bring a playful and contrasting element to a garment as say a playful cuff, sash or sleeve. Perfect for a dress, top, skirt but also a jacket/coat or gown. You could use this as you would any brocade, suiting, coating or scuba knit. A 2 Yard Piece.